Relay FRC3A-DC12, 12VDC, 70A, SPST, NO Vehicle, electromagnetic relay FRC3A-DC12 with coil voltage 12 VDC and contact system SPST NO with rated values 60 A / 14 VDC. 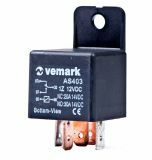 Electromagnetic relay, FRA3C-DC12, 12VDC, 15A, SPDT, NO-NC Electromechanical relay FRA3C-DC12 with rated coil voltage 12 VDC, contact system SPDT - NO-NC. 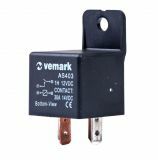 Automotive Relay, AS408 1Z, 12VDC, 30A, NO+NC Automotive relay with contacts load capacity 12 VDC / 30 A. List Price 4.90лв. VAT Incl. 4.66лв. VAT Incl. 4.41лв. VAT Incl. 4.17лв. VAT Incl. 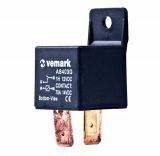 Electromagnetic Automotive Relay FLASHER 96312545, 12VDC Electromagnetic automotive relay FLASHER 96312545 with rated coil voltage 12 VDC. Price 5.53лв. VAT Incl. 5.25лв. VAT Incl. 4.98лв. VAT Incl. 4.70лв. VAT Incl. Electromechanical Automotive Relay 897P-1AH-S, 24VDC, SPNO, 25A Electromechanical Automotive Relay 897P-1AH-S with 24 VDC coil voltage, SPST 1NO contact system and 25A / 28VDC contact rating. Electromagnetic Automotive Relay With Resistor 12VDC/30A SPST - NO, AS403R Electromagnetic automotive relay AS403R with rated coil voltage 12 VDC, contacts load capacity 30 A and contacts configuration SPDT - NO+NC. Electromagnetic Automotive Relay With Diode 12VDC/30A SPST - NO, AS403D Electromagnetic automotive relay AS403D with rated coil voltage 12 VDC, contacts load capacity 30 A and contacts configuration SPDT - NO+NC. Electromagnetic Automotive Relay 12VDC/30A SPST - NO, AS401, ASIADRAGON Electromagnetic auto relay AS401 with rated coil voltage 12 VDC, contacts load capacity 30 A and contacts configuration SPST - NO. Electromagnetic Automotive Relay AS403, 12VDC, SPST-NO, 14VDC/30A Electromagnetic auto relay AS403 with rated coil voltage 12 VDC and contacts configuration SPST - NO. Price 2.45лв. VAT Incl. 2.32лв. VAT Incl. 2.20лв. VAT Incl. 2.08лв. VAT Incl. List Price 3.50лв. VAT Incl. 3.32лв. VAT Incl. 3.14лв. VAT Incl. 2.97лв. VAT Incl. 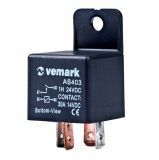 Electromagnetic Automotive Relay, AS403, 12VDC, NO+NC, NO-14VDC/30A, NC-14VDC/20A Electromagnetic automotive relay AS403 with rated coil voltage 12 VDC and contacts configuration SPDT - NO+NC. 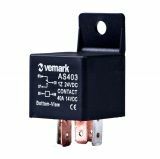 Electromagnetic Automotive Relay, AS403, 24VDC, SPST-NO, 14VDC/30A Electromagnetic automotive relay AS403 with rated coil voltage 24 VDC and contacts configuration SPST - NO. 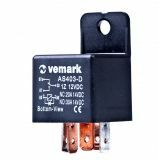 Electromagnetic Automotive Relay AS404 coil 24VDC 24VDC/20A SPST NO Electromagnetic automotive relay AS404 with rated coil voltage 24 VDC, contacts load capacity 20 A/24 VDC and contacts configuration SPST - NO. Electromagnetic Automotive Relay coil 12VDC 14VDC/10A SPDT - NO + NC V23072-C1059-W002 Electromagnetic car relay V23072-C1059-W002 with rated coil voltage 12 VDC, contacts load capacity 10 A and contacts configuration SPST - NO+NC. Car relay, S10-1C-C1-12VDC, 150mA, 40A, 14VDC Car relay - S10-1C-C1-12VDC with contacts configuration SPDT. 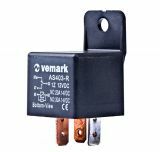 Electromagnetic Automotive Relay, AS403, 24VDC, NO+NC, NO-14VDC/30A, NC-14VDC/20A Electromagnetic automotive relay AS403 with rated coil voltage 24 VDC and contacts configuration SPST - NO+NC. Electromagnetic Automotive Relay coil 12VDC 14VDC/70A SPST - NO AS403G70A Electromagnetic auto relay AS403G70A with rated coil voltage 12 VDC, contacts load capacity 70 A and contacts configuration SPST - NO. List Price 5.50лв. VAT Incl. 5.20лв. VAT Incl. 4.95лв. VAT Incl. 4.67лв. VAT Incl. Electromagnetic Relay V23084-C2002-A403, 12VDC, 20A, SPDTx2 Electromechanical Relay V23084-C2002-A403 with rated coil voltage 12 VDC and contact system SPDTx2.